This variety of the Norway maple tree shows striking clear yellow spring and summer foliage. One of the very best for golden yellow leaf colour, Princeton Gold is resilient to sun scorch and very hardy, tolerant of most soil types, pollution and some drought. Yellow clusters of small flowers appear on the bare branches in April along with helicopter-like seeds later in the year. Expect a height and spread of around 8 x 5 metres in 20 years from this ornamental tree. With an attractive upright, spreading habit, Yellow Norway Maple makes a great tree where space allows. 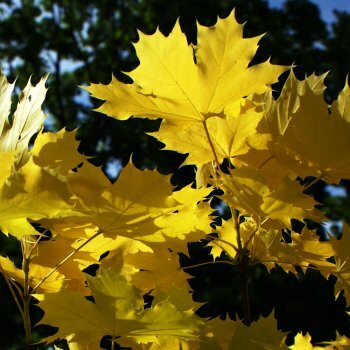 When planting Norway Maple trees, such as the Yellow Norway maple, it is important to prepare the planting area well. Pot grown Norway maple trees can be planted at any time of the year. Bare root acer platanoides trees need to be planted between November and March. If you are not planting your bare root Norway maple tree straight away, it is best to ‘heel in’ your tree. Dig a hole in an unused area of soil and pop the roots of the tree in, gently firming around. If you’re planting within a couple of days, you can untie the bag around the roots, water, re-tie and then store in a frost free garage or shed.